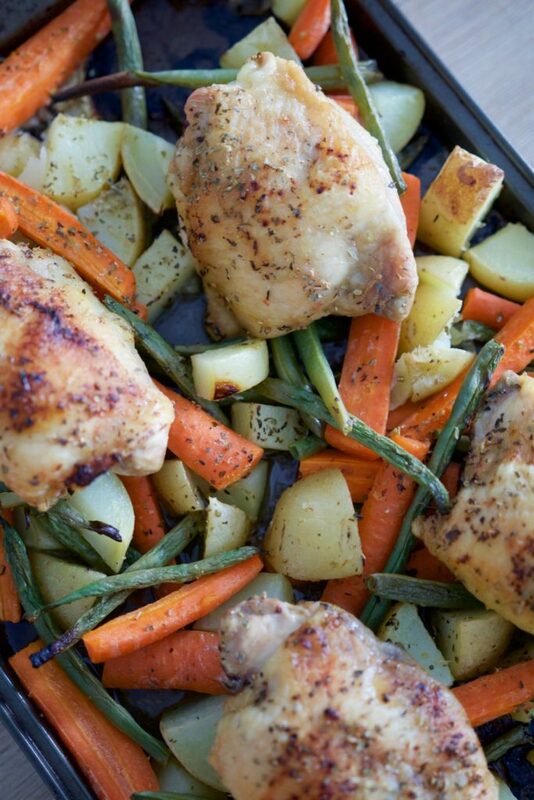 This Lemon & Herb Chicken Sheet Pan Dinner is the easiest, tastiest meal you can make! Just a few simple ingredients tossed together in the oven makes a no-fuss weekday meal. Eat as-is or pair with a fresh green salad. Sheet pan dinners have got to be the best options out there for when we just don’t feel like putting a ton of effort into a weekday (or any day) meal. Don’t get me wrong — I enjoy cooking and I think it’s a great skill to have and one that we can all acquire. But sometimes I like things to be a little easier or quicker! 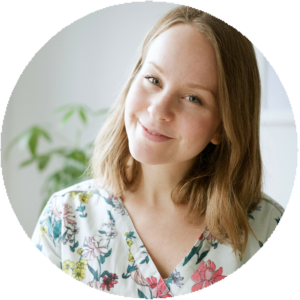 If you’ve been around my blog or videos a while you’ll also know that simple recipes are my thing. Not a ton of ingredients, not a ton of steps, and not a ton of time. All the flavour and nutrition, though. This recipe involves only just a few things. You’ll need chicken thighs, your favourite vegetables (I like carrots, yellow skinned potatoes and green beans), lemon, and a couple herbs. You can do bone-in, skin-on chicken thighs for this recipe which will yield the crispiest finish and most flavour, but also the greasiest. Not that I’m fat-phobic by any means whatsoever, it’s just preference here. Sometimes I find oily foods make my stomach a bit gurgly! Boneless skinless is the alternative and works just fine also. Note that they will cook a bit quicker. 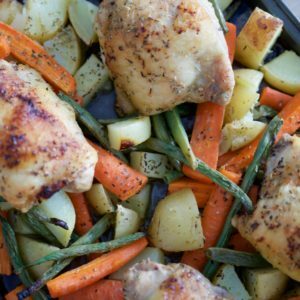 This sheet pan dinner can be eaten as a simple chicken + veg dinner, or paired with a big green salad. Serves 2-4. An assortment of veggies on a pan, topped with chicken thighs, herbs, and lemon for the tastiest one-pan dinner ever. Preheat oven to 425F. Chop up potatoes (large or small chunks, up to you), slice carrots into sticks, and chop tips off of green beans. Place all veggies on baking sheet and drizzle with oil. Mix until all are evenly coated. Nestle chicken thighs, skin up, on top of veggies so they’re slightly raised. 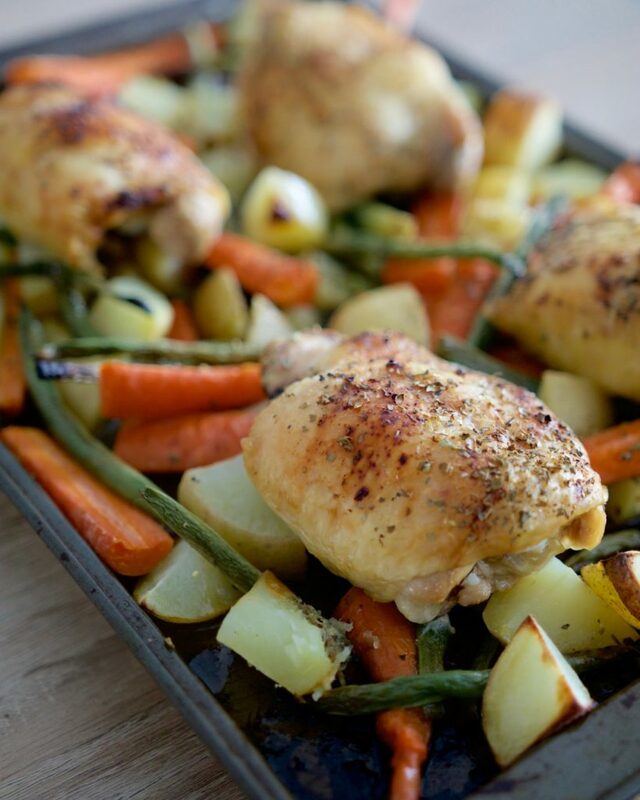 Sprinkle chicken thighs and veggies evenly with salt, pepper, herbs and juice from lemon. Make sure everything is well coated. Place pan in hot oven for about 40 minutes (less time if using boneless, skinless chicken). You’ll hear everything crackling away as it cooks. When done, chicken thighs should be brown and crispy on the top. Veggies should also be a little crispy on the edges. Transfer to plates and serve alone or with a side of fresh green salad. Bone-in, skin-on chicken thighs will take about 40-45 minutes to cook along with the vegetables. Boneless skinless will take less time, about 30-35 minutes, and can be removed while the remaining veggies continue to cook. If you want to avoid vegetables getting soggy, remove chicken once fully cooked, toss veggies, and turn on broil for 3-5 minutes before removing from oven. Store leftovers in airtight container for up to 3 days. If you try this sheet pan dinner let know by leaving a comment below or tagging me @meghanlivingstone on Instagram! I’d love to see your creations. Made this for dinner tonight. I subbed herbs de Provence for the oregano but otherwise followed the recipe. Absolutely delicious! All the flavor of a roasted chicken dinner in like 45 minutes. I can see it as a weekly staple. Herbs de Provence would be great! I’ll try that next time 😛 And yeah, such a simple meal to make! My husband cooked this for me tonight and it was so simple for him to make and simply beautiful to eat. We are looking forward to the other four one pot recipes this week. Really hoping this new discovery of cooking will help my anemia. Hey Emma, so glad you enjoyed it! Wow such a great recipe, gonna make it tomorrow for my guests, because it looks great and I can spend time with my guests while having a great meal. Do you think sweet potatoes would go in too? Hi Jenny 🙂 You can definitely use sweet potatoes or other veggies that you like!